How do you feel Hobart connects with your work, is it a place that still inspire you? I am part of a love triangle: Tasmania, Queensland and France – and as history tells us, one has to go eventually. I love the Tasmanian landscape, the weather, the food and my family who reside there however, to me, inspiration is not found in a particular time or place – it just arrives unannounced. I don’t have to be in Tasmania to be inspired – I simply have to be in a place that allows me time to think. In The Collection of Earthly Matters you involve directly members of the local town from your arts residency in Marnay-sur-Seine – does this form of engagement really seek to cement the idea of ‘residency’ for you? I have been travelling continuously with my work for ten years now – I am an itinerant. I see similarities with the journeyman/person – a traditional role of travel taken by a person when learning their trade. For many artists, being in residence is just a different or more congenial environment in another country to work – it’s not like this for me. I always make a project that directly relates to the site and the people – as an itinerant artist you learn to adapt very quickly and to never rely on anyone or any given promise or medium. Therefore, for me, residency is about the community and institutional support that allows my projects to happen – my work begins with what the community are offering me. The Collection of Earthly Matters involved asking people to present their most prized object. I then went to their homes, drew the object and repainted them in fresco style in the local church that has its own historic roman frescoes from the 17th century. The community responded by re-valuing their present day objects as objects of spiritual significance, whether it is a guitar or a bed that belonged to their great-grandmother – the project created a contemporary understanding of spiritual matters. I was trained as a valuer of decorative arts and it was surprising not one person chose an expensive item but instead, selected an object of sentimental value – I was touched by their honesty. This is another wonderful aspect of being in residence – some people took weeks to decide on an object and being in residence allows the artist to be patient, for me successful residency that allows you to directly relate to the community this requires time and for me, that means at least two months. As an Artist who works with site and communities I require support from a variety of places, to make a successful work, and if you do not have an official institution behind you require support from the community, and this can come about in the oddest of places, for me my working methodology begins with what the community are offering me. There’s going to be a wedding and you’re all invited! (where you married a tree) really captured my imagination – not just as a symbol of interconnectedness with our arboreal siblings but also as a bizarre, almost pagan rite. The piece was part of the WORKS festival in Glenorchy which is a mostly working class suburb in Hobart, how was it received and how did you feel carrying out the work? What a project! For years, I have been unsuccessfully trying to have fruit trees planted in urban communities and this was finally a way to do it. As with most of my projects the documentation did not do it justice: Glenorchy is a great place to work as the people were very open – I did not meet anyone through the whole two month project that thought that the project was a waste of rate payers money! I often work in Australian communities and surprisingly, it is usually the more middle-class communities that seem to offer greater opposition. Glenorchy was so refreshing – I found interesting people and made new friends. What is more surprising is that this work has been sneered at by several of Hobart’s conservative institutions and commercial galleries – perhaps they feel it lacks in-your-face social criticism, or that it is too popular and lacks a rarefied atmosphere, or perhaps that eccentricity is a domain only for rock-star international artists. But for me, this was a very rewarding project. People who do not normally participate in (Capital-A) art events did so on this occasion and I think, There is going to be a wedding and you are all invited, offered them an authentic experience as they immediately understood the symbology and ritual of the wedding and were not intimidated or alienated by intellectual theory. The paganism was unavoidable. Had it been held it spring, this would have been more pronounced as I would have had live animals. Instead, in order to comply with Workplace Heath and Safety regulations, I was forced to have actors in animal costumes – which added to the event’s craziness! An important aspect all of my projects is the representation of everyday life, and this is often as produce, livestock and food. I enjoy working with the general public – I find them very interesting and learn a lot about contemporary living and, I think they enjoy participating in my projects. Generally speaking, I think the general public are really unsure about what artists do these days and most still see the self-absorbed, time-rich, hard-living stereotype championed by Modernism – it is no surprise that many in the general community regards artists with suspicion. I wish someone would run an art campaign to inform the public about the range of activities common to an artist working today. Incidentally, the Glenorchy City Council and Arts Tasmania have again been generous in running an anniversary event in May at the Moonah Arts Centre, the home of the Works Festival. Public Notices is a very beautifully realised public art project – can you tell us a little about how this was conceived and how the selected members of the public were changed by the experience? I was simply wondering how people treated each other and what they did behind closed doors when I encountered a council public notice. I proposed the idea to the Hobart City Council and to Chance Encounters, an exhibition curated by Mary Knights and Maria Kunda for the Ten Days on the Island festival. With their support, together with months of pavement pounding and sometimes less-than-dignified pleas to West Hobart residents, we managed to change the street for ten days. I visited every home on Lansdowne Crescent, seeking participants. To interested residents, I asked them about what they considered to be important in their daily lives, or about what they wished to reveal or change. They then made a pledge to perform a ‘household improvement’ for the duration of the festival and the pledge was posted officially, by the council, on a notice usually reserved for a different type of improvement i.e. architectural and building construction. It was a great success and the residents responded with remarkable enthusiasm. The suburban street became an active social area where neighbours and passers-by engaged freely in conversation. 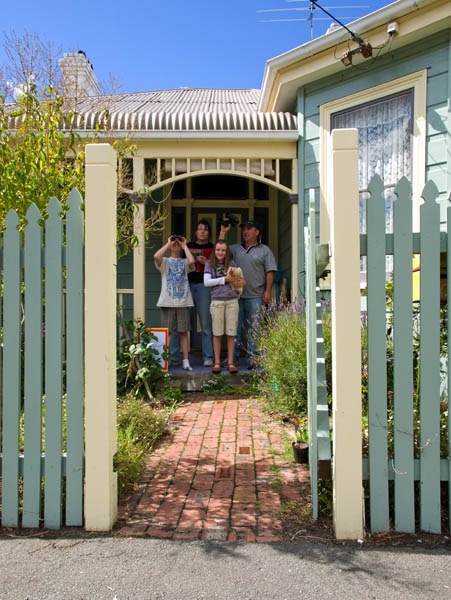 Some residents extended the project by holding their own mini art exhibitions on their fences. One household that missed the submission deadline posted a very touching hand-painted notice pledging to be more organised and to repair their front doorbell! No project remains isolated from another, the Public notice project came about by my wonderment of people and how we treat each other: what are people are doing behind the closed doors of their homes? As I said I find people fascinating, no matter who they are, I can always find something to talk about. 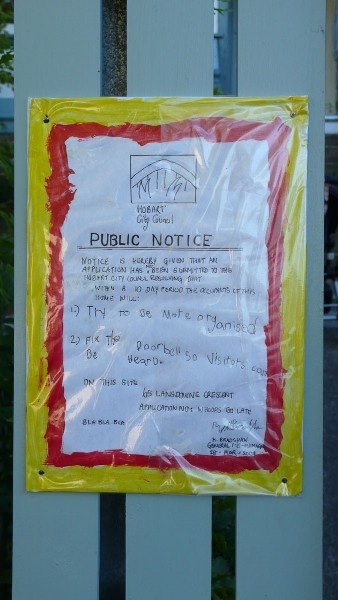 Since then, The Public Notice Project has also been run successfully in Queensland – although the outcome is always undoubtably site-specific, the idea is remarkably portable.